For over a century, California has been the world’s most advanced agricultural zone, an agrarian juggernaut that not only outproduces every state in America, but also most countries. California’s success, however, has come at significant costs. Never a family-farm region like the Midwest, California’s landscape and Mediterranean climate have been manipulated and exploited to serve modern business interests. Home to gargantuan accomplishments such as the world’s largest water storage and transfer network, California also relies on an army of Mexican farm laborers who live and work under dismal conditions. 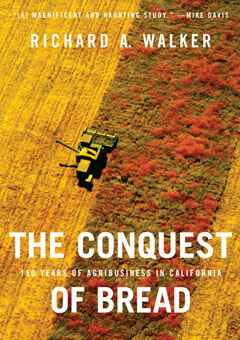 In The Conquest of Bread, acclaimed historian Richard A. Walker offers a wide-angle overview of the agro-industrial system of production in California from farm to table. He lays bare the long evolution of each link in the food chain, showing how a persistent emphasis on productivity and growth allowed California to outpace agriculture elsewhere in the United States. Full of thunder and surprises, The Conquest of Bread allows the reader to weigh the claims of both boosters and critics in the debate over the most extraordinary agricultural profusion in the modern world.